This article will demonstrate developing app that enables real time data update. Firebase exposes a rest Api to talk to this real time json database. Thanks to .NET wrapper of Firebase called FireSharp at https://github.com/ziyasal/FireSharp. We can now enable real time update to any web, desktop or mobile application using this with very few lines of code! Magical enough, we will build two simple applications in this article that will demonstrate this feature. Let’s start then. Once you register, you will be presented with dashboard where you can create your first app and choose firebase url for the same. You can give it whatever name you like and if it is available with Firebase, it will create app with the specified Firebase url. You also need to note down your app secret there which you can access from Secretes menu. This app secret is what we need in our code with every request we send to Firebase. I am calling it sender app in a sense that it will simply put one message into Firebase database so that other application that we will build can receive it in real time. The .net wrapper for Firebase is available as FireSharp on NuGet. 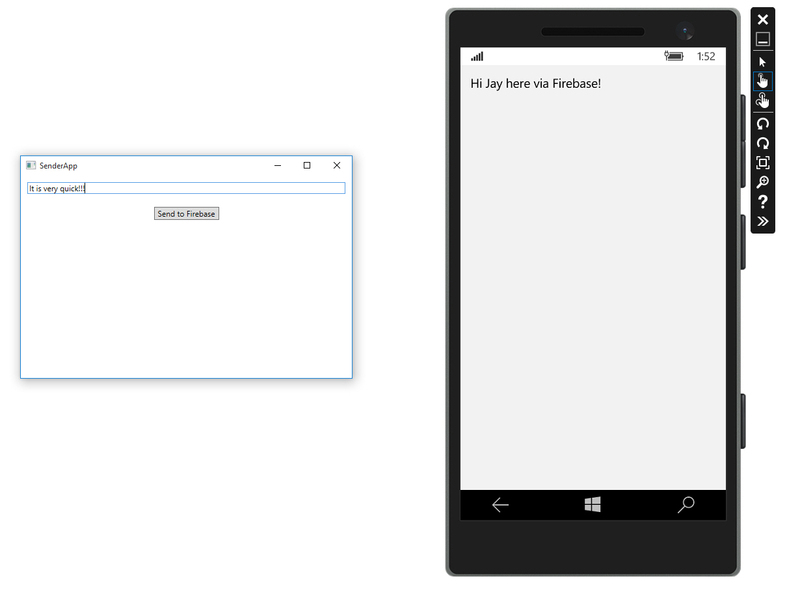 Our sender app will be simple WPF desktop app. Once you install NuGet for it, put following piece of code in MainPage.xaml to construct simple user interface. Listing 1.1 shows basic code to get started talking with Firebase. Note the use of BasePath. This basepath is your Firebase app URL that you setup in your Firebase account. The FirebaseSecret is your app secret that you obtained from Firebase account under Secretes menu. Once you do so, you can hit F5 and put some message into the text box and hit Send to Firebase button. It will insert message into your Firebase. To verify it, you can go to Firebase and can see the node inserted with your message by opening database view from the Database menu. For this app, you can choose any platform. It can be iOS, android, windows phone or any .net web app or even console app. Since I am excited about Windows 10 Universal apps, I will create Windows 10 Universal app and will use Mobile emulator to show real time update. Let’s create Windows 10 Universal app project (or any project type of your liking) and install FireSharp NuGet package. Once you are done with it, open MainPage.xaml and put following markup to show simple ListBox. The code is identical to what you wrote in Sender app but it has code to subscribe to event OnAsync. This event enables client to receive any update made to Firebase in real time. What we do here is to simply show the update in listbox. It’s time to see all this in action finally! Choose Mobile Emulator of your choice and hit F5. Now also run Sender app and try to put some message and hit Send to Firebase button. In second or two, you will message coming to your Windows Phone app in real time! Excited enough! Well, you can now visit this link to see possibilities to which you can use Firebase for your app.